Twitter — and by "Twitter," we mean the people we follow on Twitter — blew up last night with Sports Illustrated writer Richard Deitch's report that CBS and Gus Johnson were unable to come to an agreement on a new contract. That meant that Johnson, the former Knicks broadcaster and the primal id of the NCAA Tournament, would no longer unleash his screaming mania on huge moments in the tourney again. This morning, the Daily News offered hope that Gus might not be gone after all. 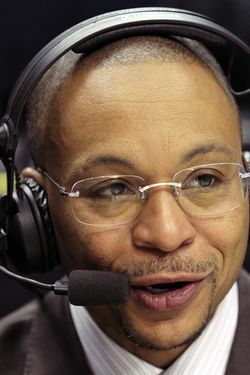 But the masses have spoken: The NCAA Tournament without Gus Johnson is no NCAA Tournament at all. a) Everyone gets way too excited to control themselves during the NCAA tournament. b) He has been doing the tournament for so long (fifteen years) that it would seem strange not to have him there. c) His notorious lack of preparation or research (and even, sometimes, seeming lack of an understanding of the rules of the sport he's talking about) doesn't stand in the way, because no one knows any of the players in the NCAA Tournament anyway. Johnson is less effective doing NFL or NBA games, because he just doesn't have the requisite knowledge necessary and, because of his erratic personal life and personality curiosities (television producers have been baffled by his eccentricities for years, which is why he's always being shuffled from job to job despite being so popular among fans), he can be a bit out of his depth during particularly important high-profile games. Also, as regular viewers of the Big Ten Network, where Johnson has worked for two years, we note that his excitement is mostly an act: The guy falls back on the same vocal inflections during a Chicago State-Northwestern game in mid-December that he does during a huge tourney game. Whatever sound that was, that was the sound of a fan going nuts. Even when it's all bluster, it's hard not to enjoy that guy. We will take Johnson's mock exuberance over the mock outrage and mythos of Jim Nantz and company any day. It's all a bit much, sure, but still ... come back soon, Gus.